Ceiba and Esperanza Immigration Legal Services (EILS) are organizing a citizenship screening session for people interested in and eligible for applying for United States citizenship on Monday, November 20, 2017 at 5:30 PM at Esperanza College, located at 4261 N. 5th St. Philadelphia, PA 19140. “Citizenship is important beyond securing peace of mind about one’s status in the country. Data shows that naturalization can yield an increase in earnings between 8% and 11% annually for a family,” stated Taylor De La Peña, Program Coordinator at Ceiba. • Have had a green card for at least 5 years (or 3 years if married to a US citizen). The session will also provide information regarding financial support to cover the costs of applying for citizenship. To reserve your space at the screening session, please call 215-324-0746. On Thursday, November 16, 2017, Ceiba at 5:30 PM will organize a briefing to educate the community on the City’s initiative to build stronger neighborhoods one park, library, and recreation center at a time. In the article, they detail the necessity for collaboration between CDFIs and VITA tax sites in order to provide enhanced and holistic asset-building services to the undocumented immigrant community. This collaboration of services, as proven by the marked success of the collaboration between FINANTA and Ceiba, will boost the economic power of the undocumented immigrant population, thus enabling them to seek increased financial stability and inject money back into the American economy. This injection of capital will not only increase the financial stability of families, but also demonstrates the economic importance of the immigrant community nationwide. Since the announcement of the termination of DACA on September 5th, Ceiba has worked to support Dreamers by providing information, legal clinics, and help with renewals. Ceiba and EILS hosted a DACA Renewal Information Session and Legal clinic on September 18th (see video below) and supported a phone bank organized by NBC10/Telemundo62 that provided necessary information to recipients of DACA and community members. Maria Thomson from EILS also shared important information with NBC10 about the next steps for DACA recipients. 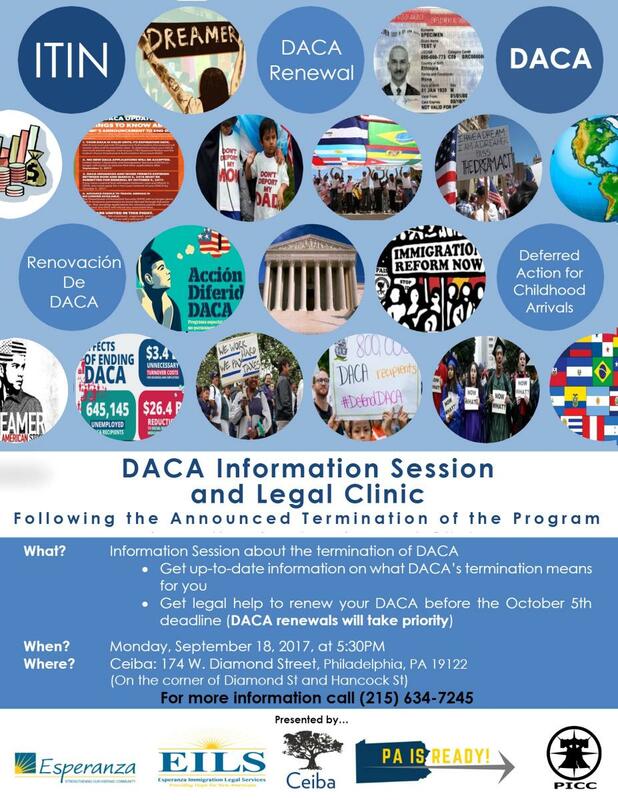 If you have any questions about the status of your DACA, do not hesitate to call us at 215-634-7245. Ceiba, FINANTA, and Santander Bank announced on Monday the launching of a pilot program that enables low-to-moderate income immigrants to save and secure low-cost loans for expenses associated with attaining US citizenship. Listen to this episode of Penn Law's "Perspective on Public Interest" podcast to hear Will Gonzalez, Executive Director of Ceiba, talk about promoting economic development and financial inclusion of under-served communities through advocacy. This podcast is produced by the University of Pennsylvania Law School's Toll Public Interest Center. On Monday, September 18th, Ceiba and Esperanza Immigration Legal Services will organize an information session to update the community on DACA following the announcement of its termination earlier this month. The event will take place in Ceiba’s new office, located at 174 W Diamond St Philadelphia PA 19122 (on the corner of Diamond and Hancock). “It is important to fully understand what the termination of DACA could mean for you. For example, those whose DACA expires between September 5, 2017 and March 5, 2018 have until October 5, 2017 to complete the renewal process,” said Mary Clark, Esq., the Executive Director of Esperanza Immigration Legal Services. There will be immigration lawyers at the Information Session to answer questions and help with renewal applications. “Staying informed of the status of DACA under the current reality is not only important for those who qualify for renewal. This information helps everyone avoid being a victim of fraud. There are scammers who would take advantage of sad moments, such as this, to scam our friends and family,” expressed Diego Tapia, Ceiba Program Director. The session will also provide information regarding financial assistance to cover the costs of renewal. Newsworks.org spoke with Ceiba's Executive Director, Will Gonzalez, about translation and interpretation assistance at the polls. Read the complete article here. The article poses the question of what kind of translation and interpretation help is required at the polls and notes that the requirements vary across counties and polling places. "Reasonable and effective," says Will Gonzalez, who heads Philadelphia-based Latino coalition Ceiba. "Those are the two subjective terms by which you judge compliance [with the Voting Rights Act.]... [It comes down to] balancing the need of limited English proficient citizens in a particular precinct relative to the resources available." Ceiba and Esperanza Immigration Legal Services (EILS) organized an event to bring the Latino community up to date on the status fo DACA in light of the recent US Supreme Court decision - and to introduce the new rules requiring ITIN holders to renew their numbers. The June 30, 2016 informational session was covered by Univision and the complete news clip can be viewed in Spanish here. 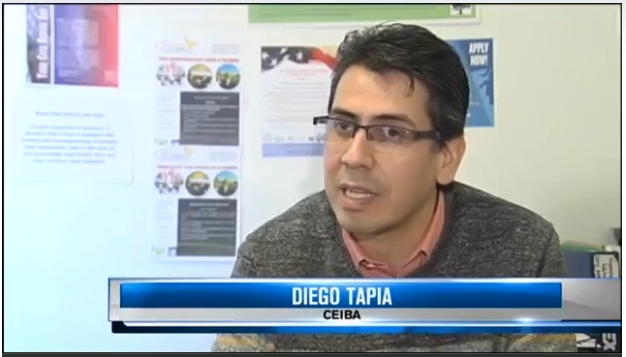 Diego Tapia, Program Director at Ceiba, spoke to 69 News about the economic contributions of immigrants to the economy - and about how the ITIN helps immigrants participate in the economy more fully. "In the future, if [immigrants] want to buy a house, if they want to get a car, credit cards, the ITIN provides that opportunity as well," said Diego Tapia to 69 News. For more details, read the complete article (both in Spanish). Telemundo: Ceiba's Executive Director urges the Latino community to vote! In an interview with Telemundo 62, Will Gonzalez, Executive Director of Ceiba, urged the Latino community to participate in the upcoming elections - both in April and November. "We ask that people vote. Those that can't, due to their legal status, should encourage friends, spouses, and family members who can," said Gonzalez. Read the complete interview or watch the video (in Spanish). And if you, a friend or a family members is still not registered to vote, prepare now for the November elections by registering online today at www.votespa.com. On March 30, 2016 at 4pm Ceiba and NCLR will lead a panel of invited guests in a discussion of recent changes to low income tax credits and the ITIN number. Join Ceiba and NCLR to learn about these important changes and their impact on immigrants. Read the press release below or view the event flyer for complete details. On December 1, 2015, Ceiba's Unauthorized Immigrant Asset Building project was voted the 3rd Best Anti Poverty Solution at a forum hosted by the Philadelphia Social Innovations Lab and its literary counterpart, the Philadelphia Social Innovations Journal. Ceiba's project uses free tax return preparation for unauthorized immigrants as a gateway to asset building. Consultations with experienced social innovation entrepreneurs to enhance core comptencies. The opportunity to participate in a Business Plan Pitch Competition at the forum. Ceiba secured its 3rd place finish with its pitch before members of Philadelphia's philanthropic and social innovations community. For more details on Ceiba's participation in this competition, visit the Social Innovations Lab webpage or read the letter below. This video collaboration with NCLR features Ceiba's Executive Director Will Gonzalez talking about the importance and value of income tax credits for working families and their communities. The Earned Income Tax Credit and Child Tax Credit are keys to financial stability for families and economic development for local communities. Ceiba joins NCLR in urging Congress to support these credits. Ceiba joined Concilio, Juntos and NCLR in advocating to protect tax credits for working families currently scheduled to expire at the end of 2017. The event was covered by the Al Día newspaper and the article about the event can be found online on the Al Día website. On October 2, 2015 El Sol Latino newspaper published this article on Ceiba's call to increase Latino access to public housing. The article highlights Ceiba's efforts to increase awareness of public housing disparity and it's call to remedy Latino underrepresentation in public housing. "Latinos are underrepresented in the tenant rolls of PHA. The 2013 American Community Survey revealed that Latinos comprise 22.5% of the people eligible for PHA housing, yet according to PHA, Latinos represent only 7.2 percent of their tenant population." Ceiba's Unauthorized Immigrant Asset-Building Project was among the winners at the Anti-Poverty Solutions Summit held by the Philadelphia Social Innovations Lab. As a winner, Ceiba has been invited to participate in the Fall 2015 Social Innovations Lab Cohort. The Philadelphia Social Innovations Lab is an outgrowth of the Philadelphia Social Innovations Journal. Ceiba's collaborative efforts with The Latino Voter ID Work Group have been highlighted in a new book titled "Partnerships for Health and Human Service Nonprofits." The book is "the first comprehensive guide and toolkit for creating meaningful and successful nonprofit partnerships." Ceiba's work is profiled in the section titled "The Latino Voter ID Work Group: A Case Study of Collaborative Leadership in Philadelphia's Barrio." The case study can also be found online in the Philadelphia Social Innovations Journal. Ceiba's June 15 financial workshop for immigrants was announced by the Al Día newspaper in an article in the June 14-20 edition. The workshop, in Spanish, will cover mortgages for ITIN holders, efforts to allow unauthorized immigrants to obtain driver's licenses, and the latest information about immigration policies. 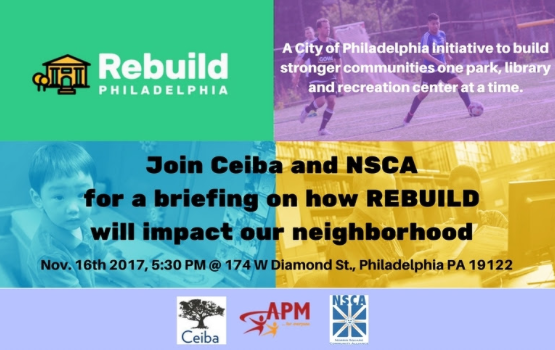 Join Ceiba on June 15 at 6pm at 147 W. Susquehanna Ave.